A few words concerning the religious situation on the occupied territories of Eastern Ukraine. It’s been often overlooked, so I want to share my assessment of the religious war in Donbas. 2. But Evangelical Christians, Orthodox of the Kyivan Patriarchate, Greek Catholics and Roman Catholics have become a particular target for militants of the self-proclaimed Donetsk People’s Republic (DNR) and Luhansk People’s Republic (LNR). After all, separatists have adopted not only Russian heavy war equipment, but also religious and geopolitical concept of the Russian World, developed in Moscow. Then came the illegal armed unit Russian Orthodox Army, and the DNR “Constitution” confirmed the rejection of religious freedom in favor of the Russian Orthodox Church of the Moscow Patriarchate, as a result a religious terror began. Finally, there was the murder of pastor’s two sons and two deacons from the Transfiguration Church in Slavyansk. Purposeful abduction of pastors and priests, their cruel interrogations with tortures and beatings. General occupancy of the temples and prayer houses of the Evangelical Christians and other religions, not related to the Moscow Patriarchate. 3. The current religious persecution in Donbas is an odd phenomenon for the Donetsk region and for Ukraine in general. Hundreds of religious communities of different Orthodox jurisdictions, Evangelical denominations, Jews, Muslims, Buddhists and Hare Krishna communities coexisted in these territories for decades before the military conflict and Russian aggression. 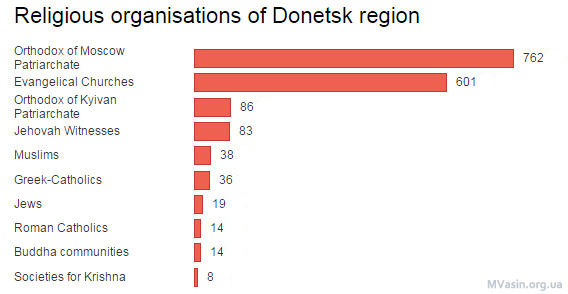 For example, according to official statistics of the Ministry of Culture of Ukraine, at the beginning of 2014 there were 1,797 religious organizations in the Donetsk region. Among these, 762 Communities of the Ukrainian Orthodox Church (Moscow Patriarchate), 366 Evangelical Christian Churches (Pentecostals, Charismatics, and others. ), 186 Christian Baptist Churches, 86 of the Kyivan Patriarchate, 83 Communities of the Jehovah’s Witnesses, 49 Churches of Adventist Christians, 38 Muslim communities, 36 Greek-Catholic parishes, 19 Jewish communities, 14 Catholic parishes, 14 Buddhist communities, 8 societies for Hare Krishna and others. 4. Ideologists and producers of the Russian occupation of the Crimea and Eastern Ukraine have artificially built in religious hidden motives in the bloody picture of the events in Donbas. As a result, separatists began to explain their riots and religious intolerance to all dissenters as the struggle for the Russian Orthodox faith. Taking into consideration that the Ukrainian Orthodox Church (Moscow Patriarchate) in Donbas has always been the dominant religion, the separatists’ excuses that they took up arms to defend against an expansion of sects, Catholics and Greek-Catholics from the West sound ridiculous. 5. Long silence of the Moscow Patriarchate’s representatives in Kyiv and Moscow concerning the terror in Donbas, the concept of the Russian World taken by separatists as the basis and creation of the Russian Orthodox Army as result directed all the negative of Ukrainian citizens straight at the entire church structure of the Moscow Patriarchate, including parishes in Ukraine. For some, such a change of public opinion was the reason for the series of initiatives to change the canonical jurisdiction of the Orthodox communities of the Ukrainian Orthodox Church (Moscow Patriarchate) in different regions of Ukraine in favor of the Kyivan Patriarchate. But if such transitions are accompanied by pressure from politicians or local businessmen, civil servants or priests, they only inflame the hearth of the interchurch conflict that must be avoided. For many years, Ukraine had a high level of religious freedom, religious diversity and tolerance among different religions. And we all need to make every effort to preserve and increase it. Especially there, where praying and attending places of worship have become life-threatening.